Here we take a look at what’s on in the Lake District in April. The beautiful Edenhall Estate is worth a visit for the views alone. With a backdrop of the Pennine Fells, it’s an impressive setting for a wedding fayre. If you are thinking of getting married in the Lake District, then you’re bound to find everything you need at the Spring Wedding Open Weekend, taking place the 6th and 7th April. Russell Watson is one of the biggest classical singers of all time, putting him up there with the likes of Pavarotti. Having sold over 7 million albums, you can catch the charismatic singer at Coronation Hall in Ulverston on 10th April. Lee Ridley won Britain’s Got Talent in 2018, with his comedy act Lost Voice Guy. If you’re looking for something fun in the Lake District in April, then book a seat for the Beggar’s Theatre on the 13th April. If you want to make the most of a spring break in the Lake District then check out what’s on during the Bowness Bay Blues Weekend. The popular blues festival takes place in Windermere from the 12th to 14th April. There are a variety of artists from traditional blues to a Thin Lizzy covers band. During the day you can enjoy a trip to Grange Over Sands, where there’s the annual Prom Art event on Sunday 28th April. It’s the chance to support local artists, with over 80 stalls offering a wide variety of talent. So whether it be an interest in photography or the fine arts, you never know what you might find to take home with you. 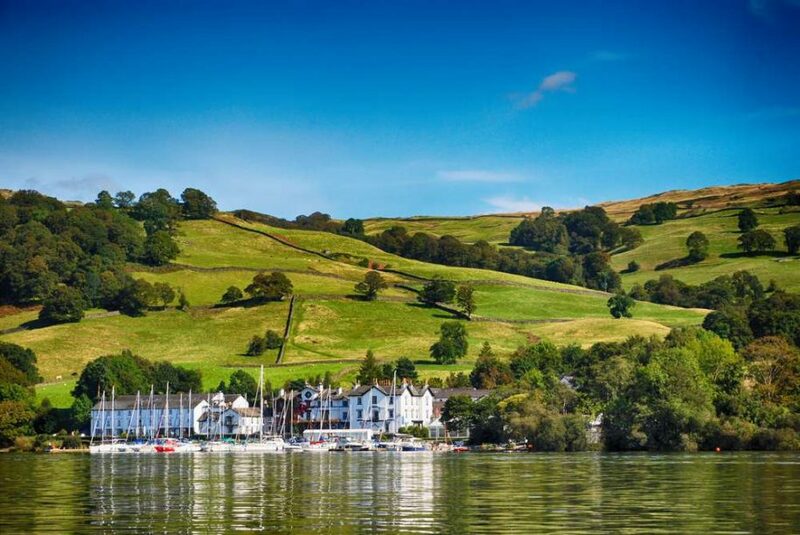 When it comes to a package break in the Lake District in April, then Easter Bank Holiday in Windermere is a perfect time of year. Especially if you’re visiting friends or family with children, as there are a number of activities available. It’s worth checking what’s on in the Lake District at The World of Beatrix Potter. While elsewhere Easter Bank Holiday offers a whole host of Easter Egg hunts and much more. If you’re looking for somewhere to stay in the Lake District in April 2019, we have a choice of spa suites available. Our spring package breaks in the Lake District offer a variety of other facilities, including spa treatments at the main Aphrodite’s Lodge Hotel Pool & Spa. The main hotel is just a few minutes’ walk from your Windermere boutique spa suites. However, staying at one of the 3 Windermere boutique spa suites you will get to enjoy the same high level of service. Not only that, but you still get your own private hot tub. So why not book your Spring Break in the Lake District today and enjoy a touch of luxury.